How much space is required for the show? Ideally we like a space of 20 feet wide and 15 feet deep but have worked in smaller venues when needed. For large crowds (100 or more) a 2 to 3 foot high stage provides the best view for the crowd. Also, the animals need to work in the shade at outdoor summer events. 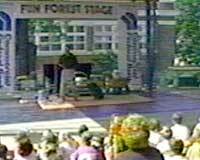 Do the animals do only big events like State Fairs? No. 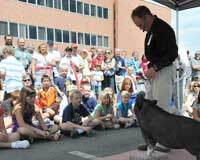 In addition to a lot of big events for crowds of hundreds, the animals also do smaller events like local Libraries for 50 or fewer. Do the Pigs leave a mess? No! 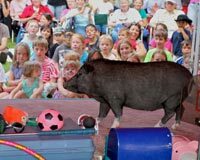 Pigs are very clean animals and these performers are professionals. They are clean and they do not go to the bathroom at the show. How do the larger outdoor crowds hear? We have a large sound system for CD players and with a wireless mic and powerful speakers. What does the event have to provide? 110 volt power for the sound system, space to do the show and a hard flat surface for the animals to work. Can the show be customized for our event? Yes, we can change the length of the show (typical show length is about 30 min). We can also customize the animals and the scripted for your event. Are the shows a kids' act? No! 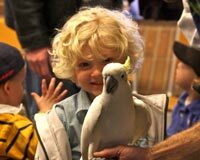 Kids do love the animals but most of our performances are at family events. The shows have enough clean adult humor and amazing tricks that they have merited three performances on the Tonight Show with Jay Leno and one on Late Night with David Letterman, hardly kid shows. When all is said and done the adults enjoy the show even more than the kids. How far in advance do we need to book the show? Summer events can book fast so the earlier the better but each year is different so it is always advisable to call and check. One day events can often be fit in somewhere. 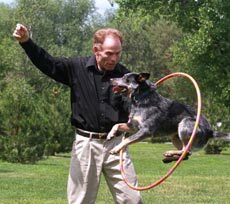 We perform across the USA for large events. But since we are based in Colorado, one and two day events are mostly done here in the state due to the cost of travel. Yes! 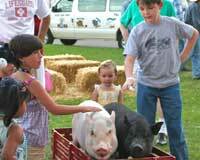 Pigs are smart, clean, affectionate, and great problem solvers, making them great performers. Do the animal rights people protest the pigs? No, we have never had any animal rights people complain about the pigs (knock on wood). Watching the pigs work; people can see how they enjoy performing with their tail always wagging. They can also see the animals are never forced to work but are rewarded for doing a good job.